Trails End condos show a very straight face streetside, but are naturally landscaped on the backside, which runs seamlessly to national forest land used as a ski run in the winter. Any Trails End Condo for sale will be located just above the Quicksilver Lift, so true ski-in and ski-out. Trail End is conveniently located on Village Road, about a block up from downtown Breckenridge. A recent exterior remodel warmed-up the look of the entrance, which provides a sheltered drop off zone, and access to a common lobby with ski storage. All the Trails End condos have a balcony, and some include underground parking. Several of the Trails End Condos are one-bedroom units, so this is a good complex to search if looking for a lower overall price. Start your search for that perfect ski-in/ski-out condo with the Trails End condominium listings below, or read more about the amenities. Trails End condos are located near the end of the ski run called Lehman, a convenient distance above the Village, and just a quick glide to the terminus of the Quicksilver Lift. In the past, this lift was often crowded and stopped low on the mountain, but since 1999, the Quicksilver has been a dual-loading, high-speed six-person Poma lift, able to transport 3,600 skiers per hour to the top of Peak 9. In addition to quick access to Alpine skiing, the Burro Trailhead is across the ski slope about 200 yards up, and is great for hiking, biking and cross-country skiing. Trails End are part of the Upper Village Homeowners Association, which maintains the nearby Upper Village Pool and was completely remodeled and put back into service in December of 2009. This swim center includes three hot tubs, one interior and two exterior. It’s across Village Road from Trails End. Downtown Breckenridge, with shops, restaurants and clubs, is only a block away. Free shuttles also run up and down Village Road to the outlaying supermarket and the other ski base stations. 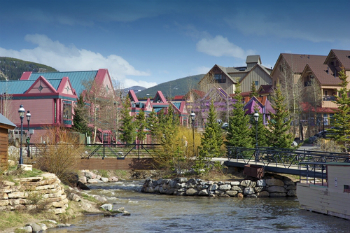 By foot, car or free shuttle, Trails End at the foot of the Breckenridge Ski Resort is quick and convenient. Size (SFLA): 537 sq. ft. to 1428 sq. ft. Amenities: ski-in, ski-out, close to town, community pool, elevator, sauna, hot tubs, small common space, separate ski locker area, underground parking. True ski-in and ski-out, Trails End is located directly on the ski run just a few feet above the base of the Quicksilver Chair. Glide down to the maze and this Super6-style will give take you to a great vantage point on Peak 9. Drive south on Park Avenue and turn onto Village Road. 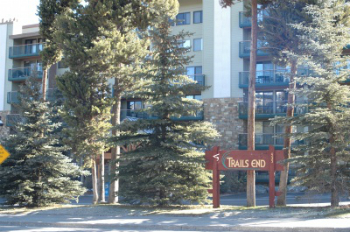 Trails End Condos are located on the first group past the Village, .2 mile up, before the Cedars. Let us answer all of your Breckenridge real estate questions! Send us a message or give us a call at (970) 453-2200, today.